I was sitting at my desk at home last week typing busily away when I became aware of a flurry of activity in the native cherry outside the window. I thought it might be one of the varied-trillers; the male and female can often be seen around the garden, most recently with a hungry chick in tow. 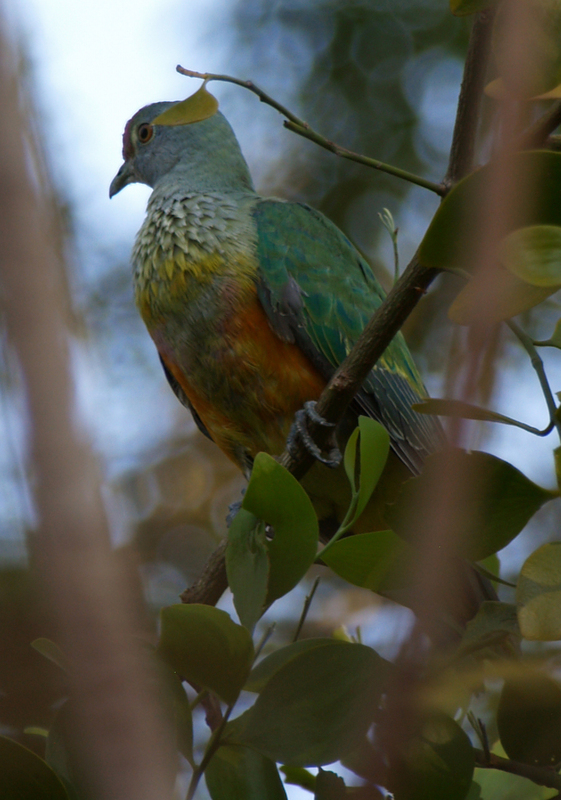 The trillers would have been a lovely enough distraction, but in fact it was a rose-crowned fruit-dove. The male’s bright colouring of yellow, orange, green, grey and pink really stood out against the dark green foliage. I’d never seen this dove before let alone found one in my garden. Rose-crowned fruit-doves are notoriously difficult to see as they tend to sit in the canopy hidden amongst the leaves where they look remarkably leaf-like themselves, so the fact that a male was foraging in a tree right outside my office window was a pretty special thing. This one was quite bold and not at all fazed by the yellow figbirds and olive-backed orioles also foraging noisily nearby. In fact he seemed to be posing and it would have been rude not to sneak outside and take his photo. Once back inside I added him to the growing list of species I’ve recorded on my bush block in the last couple of years. He’s number 88, but he’s so much more than just a number. We all have birds on our blocks and we probably can hear more of them than we’ll ever see. But what do they actually contribute to our lives? Birds mean many things to many people. For some people birds are a means to an end, for example their meat is used for food or their feathers for decoration; others appreciate them for their colours or songs and may create paintings or write poetry about them. The thrill of the chase drives some enthusiasts to travel thousands of kilometres just for a sighting of something unusual. Scientists get excited about birds too as they can teach us not only about their own life histories but also about the workings of our natural environment. Some people find them a nuisance when they eat the best of the veggie patch. But for many of us they simply make the experience of rural living that bit more enjoyable. Exploring the values that Australians hold for native birds has shown me they play a far greater role in our lives than we might realise. Over three hundred different birds lend their names to Australian streets, towns and waterways. Would it surprise you to know that swan is the most popular breed with over 250 locations named after it? We see images of native birds on our coins and stamps, while government, councils and the defense forces use birds as emblems to reflect their values. And of course Australia’s love affair with sport would be far different without the Crows, the Roosters, the Magpies, the Sea-Eagles, the Kookaburras and all the rest. Birds add richness to our language giving us colorful and unique idioms such as ‘ostrich policies’ and ‘budgie smugglers’, someone can be a ‘drongo’ and something can be ‘grouse’. Bird watching is a popular activity and contributes significant amounts of money to regional and remote economies around Australia, not just from local twitchers, but also from international visitors. Overseas our international identity is wrapped up in many of the creatures unique to our country: tourists flock to buy gifts such as tea-towels, post-cards and posters illustrated with parrots, emus and kookaburras. And what economic value could we place upon the environmental services birds provide such as pollination of plants and pest control through feeding on insects and rodents? Yet for all our native birds contribute to our society, they are neither as loved nor as protected as they need to be. 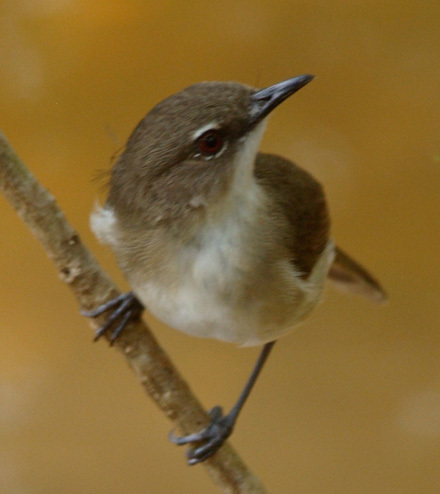 There are over 800 species of native birds in Australia but around a quarter are currently endangered. Take for example the orange-bellied parrot. 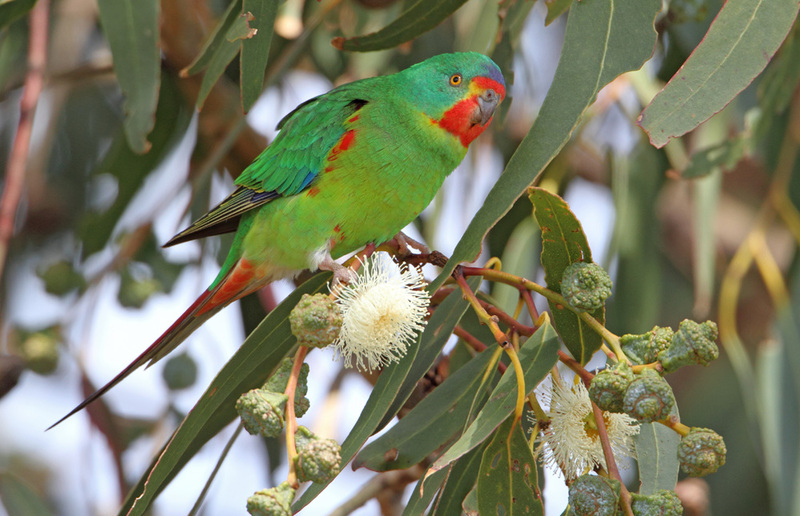 It is one of only two migratory parrots found in Australia. It is also one of the world’s most endangered animals. Experts estimate there are about thirty adults left in the wild. Another hundred or so exist in a captive breeding program and it’s hoped that in a few years’ time their offspring can be released back into the wild. But will the habitat they need still be available to them or will it have been developed for our own purposes? That so many species of birds face extinction is a national tragedy. When I see a logo of a Tasmanian Tiger on a beer bottle, I wonder what society must have been thinking to drive such a creature to extinction; what will future generations make of us, with our resources and riches, if we allow so many more of the species we’re entrusted with to perish on our watch? In the Top End we are lucky to live with bountiful biodiversity, but even so, over 200 species of wildlife found in the NT are endangered. Our birds face threats on many fronts and habitat loss is the most significant. While the rate of development around about us can seem daunting, through the Land for Wildlife program we have an opportunity to stall habitat loss to some degree. That’s why I think Land for Wildlife is so important: we can contribute towards the protection of native birds through managing our properties in an appropriate way. By working with our neighbours and other Land for Wildlifers to protect existing habitat and plant new bird-friendly areas, we can provide essential nesting and foraging resources for our Top End birds. This gives them a far better chance of survival against the threats they may face elsewhere. During my research, I’ve been interviewing many people involved in recovery efforts for some of our threatened birds. One story emerged that should encourage all “Land for Wildlifers”. A lady in rural Victoria noticed a large flock of unusual birds feeding on the ground near her property. 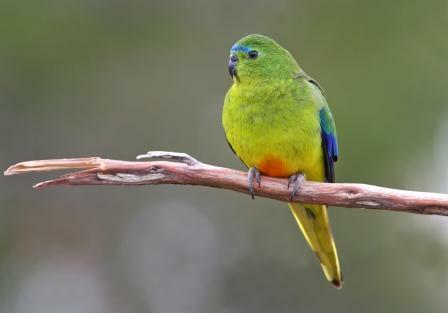 She identified them as the endangered swift parrot and contacted a member of the swift parrot recovery team at Birds Australia. These birds hadn’t been recorded in this area before and the grazing behavior she observed was previously unknown to scientists studying these birds. She gathered hours of video footage which resulted in the scientific knowledge of this species being rewritten and her local area has become an important reserve for the endangered birds. This passionate lady has gone on to become a champion in the cause of swift parrot recovery. By understanding what we get out of birds, we can also identify ways that we can give something back to birds. For example as a group, we Land for Wildlifers hold a great deal of knowledge about land management in the Top End. All those hours spent weeding, planting and observing wildlife are worth more if we share our experiences with others. One way we can do that is through citizen science where the public, interested amateurs and professionals can all contribute to scientific knowledge, for example by recording our wildlife sightings on the Atlas of Living Australia (ALA). 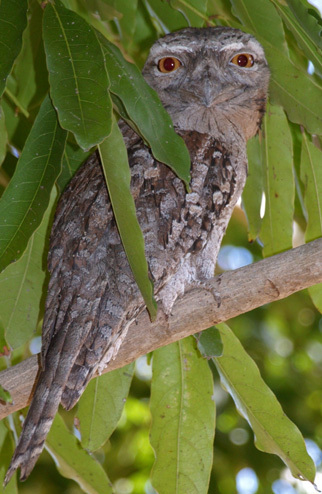 If you visit the ALA webpage and go to the “Explore” tab (http://www.ala.org.au/explore/) you can view which species have been recorded in your area. Go to “Share” and you can upload your own sightings. I did a search for my immediate area and discovered that of all the 150 odd bird species recorded, there’s only one previous record for a rose-crowned fruit-dove. My record will make two. But I’ve also realised there are at least 70 more bird species to add to my bush-list. Can’t wait to see them all! So, take note of what you see in that tree or that different call you hear one morning, and share it; it may mean a lot more than you imagine.